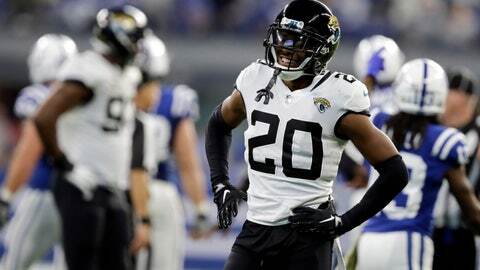 JACKSONVILLE, Fla. (AP) — Regardless of his rant on social media, Jalen Ramsey would love to spend his career with the Jacksonville Jaguars. And the chatty cornerback has a video game to prove it. Frustration is starting to surface for the Jaguars (3-6), who bolstered big hopes from reaching the AFC title game last year by starting 3-1. They haven’t won since then, and their fifth straight loss last week to the Indianapolis Colts was marked by missed assignments and blown coverages. At least one of them belonged to Ramsey, the Pro Bowl cornerback who was supposed to drop in coverage and instead played man defense as tight end Eric Ebron ran free for a 53-yard touchdown catch. The following morning, Ramsey took to Twitter to vent about the negative blowback in Jacksonville. “When I’m gone from here, y’all gone miss me. I ain’t even trippin,” it said. Ramsey, a first-round pick in 2016, still has another year on his contract with an option that would take him through 2020. And he hopes it would go longer than that. “I’ve said multiple times … that I want to play with one team my whole career,” Ramsey said. He also hasn’t removed the tweet or backed away from it. The Jaguars are on the verge of popping themselves out of any shot at the postseason, trailing Houston by three games in the AFC South, winless since Sept. 30. Next up are the Pittsburgh Steelers, whose fifth straight victory was a 55-21 dismantling of the Carolina Panthers a week ago Thursday night. Ramsey, in an interview with GQ last year, said he was more impressed with receiver Antonio Brown than quarterback Ben Roethlisberger, who he referred to as “decent at best” and that Roethlisberger “really disappointed me” the two times the Jaguars beat the Steelers, including the AFC divisional playoff. With a chance to return the favor, Roethlisberger didn’t nibble when asked about Ramsey. The trick for Ramsey and the rest of the Jaguars’ secondary is to look smart by knowing who they’re supposed to be covering. Ramsey attributed the blown assignment against the Colts to not hearing the call from the other side of the field. Whether it’s communication or formation, Ramsey is more interested in a solution.